Don Miles is an agent with the Central Security Council. According to the Director of Operations of the CSC, who goes by the name of Hedge, the best way to sneak an agent into a country is out in the open. If you send someone that everyone already expects to be there, no special notice is made. Thus his agency has recruited an assortment of men and women at the top of their differing fields, trained them in all they might need as an agent, and then let them go back to their normal lives. If and when one travels to a place where the CSC needs something done, there they are. 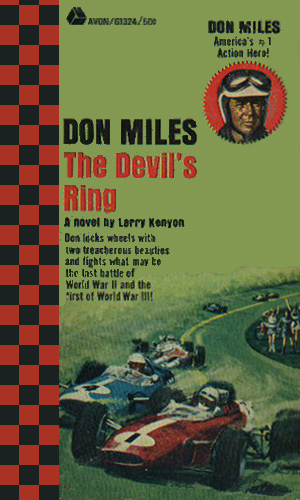 Don Miles, a young man still in his late 20’s or early 30’s at the start of the series, is the wealthy son of an oil baron who has learned the trade literally from the ground up and has expanded the business considerably before turning day-to-day operations to his key people and taking up his true passion, auto racing. Somewhere in between he had served a tour in the Korean conflict. A minor accident while test-driving his revolutionary car, the Panther, gave Hedge the opportunity to fake a major injury for Miles and give him six months of intensive training. Now Miles travels the world with his famous racing team, competing in major events while secretly working on behalf of the U.S. government. When the cover of the racing to protect his operations do not quite cover him enough, his oil business certainly can as everyone is interested in oil money. Miles has gone through all the normal training an operative would have and is skilled in hand-to-hand, weaponry, stalking, and B&E. He is a deadly weapon when he needs to be, and a handsome, suave and smooth operator when that works. 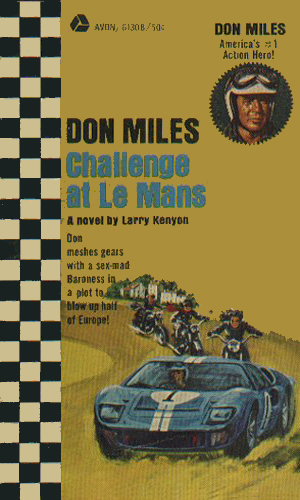 Racing at Le Mans, Don Miles finds himself up against a gang of motorcycle hooligans, all female, led by a secretive woman called the Baroness, a less than nice lady planning to blow up half of Europe. In Germany for another major race, Don Miles learns of a plot to steal a fortune and smuggle it to Red China while killing an entire valley's population to hide the crime. 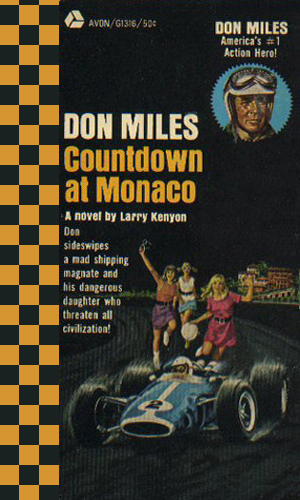 A mad scientist and his even crazier beautiful daughter have a scheme to destroy thousands and it involves the very cars that Don Miles is racing against at Monaco. 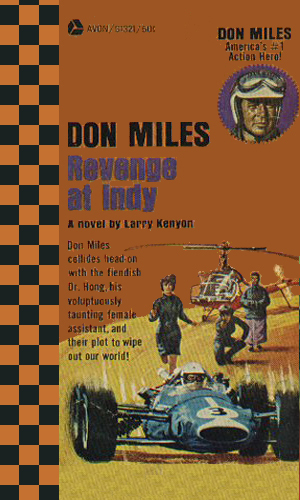 A power blackout in Indianapolis where Don Miles is racing is just the first step in a major Chinese plot to blow up an entire state and throw the U.S. into chaos. I swear this is a television show novelized but no, it isn't. It just seems that way, although with the racy scenes interspersed with the racing ones, it would never have made it through the censors intact. Looking at the covers you would think this series was a juvenile/young adult publication but reading them you can see why, even though the covers look like they would be, not many public schools would likely have them. Don't read this series if you are expecting much but if you aren't, you'll find exactly what you'd expect and you might have fun. A little bit, maybe.